This is one of those special books that when I opened the packaging I had to spend a few minutes staring in awe and stroking the pages. I wanted lock myself away and pore over every page and take in every amazing detail. Yes, this is an Atlas, but not like any you have seen before. It is a whole world of information, stunningly and accessibly presented for children of all ages. Do you know where to find the longest coastline in the world? Or the longest road tunnel? The highest bridge, tallest building, highest waterfall or fastest train? This book is filled with the sorts of facts kids can’t get enough of and will be endlessly sprouting back to you at random moments. The graphics and layout are just amazing. There are 3D representations of each continent, showing everything from country borders to landscapes, time zones and population distribution. Famous landmarks and native wildlife have pictorial representations along with descriptions and interesting facts. The book starts with a fascinating history of the formation and development of the Earth and then goes on to profile each continent in detail. It even explains the climate of each area, with clever graphics showing temperature, winds, average hours of sun, precipitation and even prevalence of storms, tornados and bushfires. Finishing off with a reference guide of flags of the world and a glossary of tricky words, this is now officially my go to book for all future school projects! This is an absolutely stunning reference book and so jam packed with information I can’t possibly explain it all here. However, the thing that makes this one stand out is its graphic layout. It is not dense or text heavy. Most of the information is explained through clever graphics that make you want to explore and absorb every detail. Isn’t it nice to be able to give the kids a book that answers all their questions rather than sending them to the internet for once! This is an amazing information book that I can’t recommend enough for school and home libraries. sarah do you think this atlas is only for children? Hi Miranda, thanks for your question. 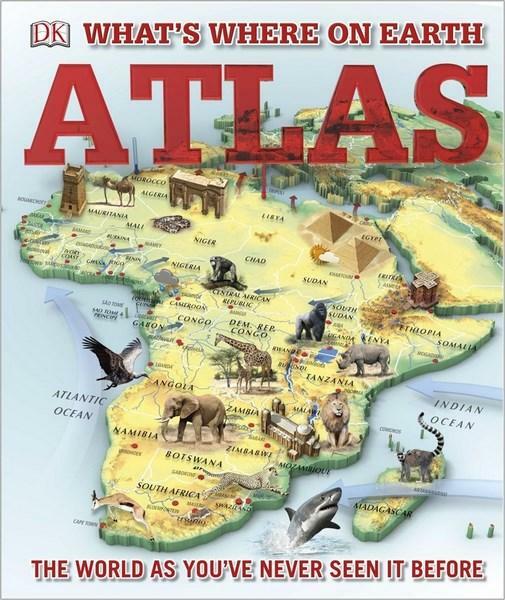 The information in this atlas would be of interest to people of all ages. I found the population and climate distribution across each continent fascinating and some of the facts are probably of more interest to adults than children. For example, latitude and longitude points, highest and lowest points on continents, population in urban versus rural areas, most visited cities and busiest airports. However, the visual representations of wildlife and famous landmarks (as per front cover image) are designed to appeal to younger readers. So, it is probably more a question of whether potential older readers may be turned off if some images come across as too ‘young’ for them.